The magnificent Yamaha CFX Concert Grand Piano was placed in Abbey Road Studios' legendary Studio One, where award-winning engineers used the world's greatest microphones and equipment to create a truly stunning virtual instrument. 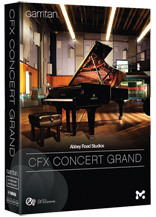 Garritan Abbey Road Studios CFX Concert Grand features three discrete perspectives: Classic: captures the natural tonal character, clarity, and nuance of the instrument. Contemporary: produces a bright and brilliant sound with definitive attack from the hammers. Player: delivers the unique experience of playing from the piano bench in Studio One. Every facet of this project---the instrument, the room, the engineers, and the microphones---reflects the perfection only the most passionate can produce.